A boardwalk meanders from the spring run to the Suwannee River, through a cypress stand good for migrants and Prothonotary Warblers. Watch the far shore for cryptic Limpkins; you may hear their raucous cries long before you see them. West Indian Manatees are present in the spring run and river each winter, and from December 1 to March 30, the spring run is closed to paddlers to protect the manatees from disturbance. At the river, there is a large Turkey and Black Vulture roost, as well as an opportunity to view wading birds and ducks on the river. The park offers over 8 miles of nature trails through cypress swamp and uplands; the best birding opportunities are near the river. Listen for Barred Owls, Yellow-billed Cuckoos, Eastern Wood-Pewees, Yellow-throated Vireos and Northern Parulas during warm months; winter visitors include American Robins, Baltimore Orioles, Ruby-crowned Kinglets, Hermit Thrushes and Blue-headed Vireos. Ranger-led walks, paddling trips and educational programs are offered throughout the year; call the park for details. 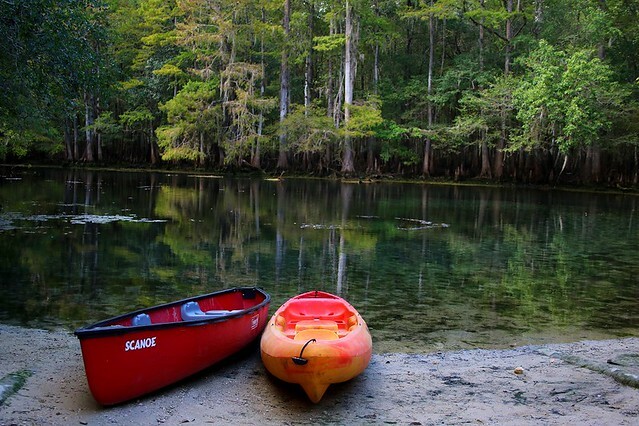 Local outfitters outside the park rent canoes and kayaks for exploring the Suwannee River. The first-magnitude spring (100 million gallons daily) is popular with swimmers. The park also offers camping for visitors looking for an extended stay.